Abbotsford Collegiate School is a redevelopment of a 60-year old school located on a 20-acre site. 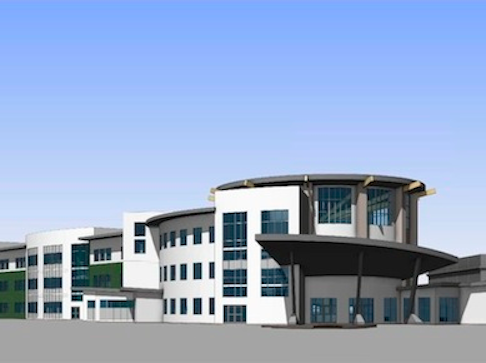 It includes a new three-storey 115,000 square foot replacement senior secondary school, a new 15,000 square foot civic branch library, and a new three-storey Neighbourhood Learning Centre that will house community social service agencies. Architecturally, the building radiates from the development’s central and unifying element, a three-storey cast-in-place concrete, steel, glass and wood rotunda that provides ample daylight and generates a stack effect for natural ventilation. Recollective was responsible for managing the sustainable design process, which involved facilitating integrated design workshops, managing the LEED Gold certification process, and performing energy modelling for both LEED and the BC Hydro New Construction program for financial incentives. wind and solar powered computer lab; if no wind or sun, students pedal stationary bikes that generate electricity!